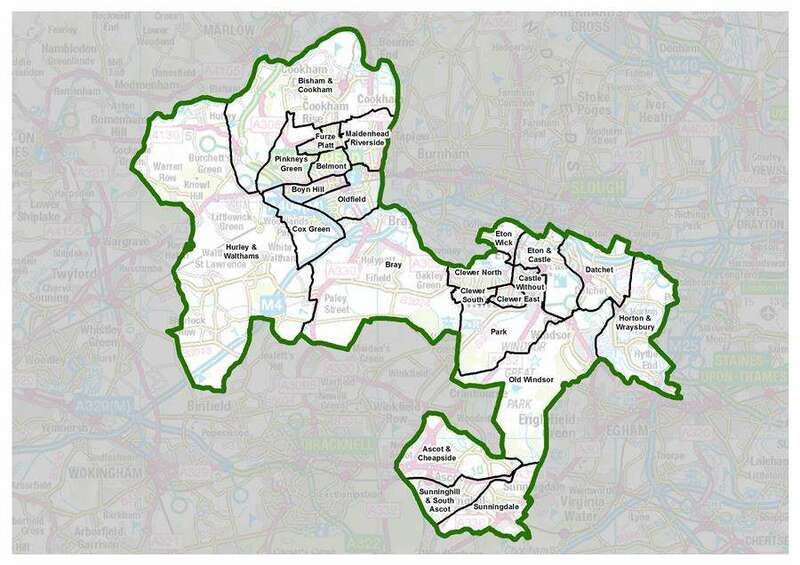 The Royal Borough of Windsor and Maidenhead have released their notice of election, detailing the election of parish councillors for each parish ward, with the election itself to be held on Thursday 2nd of May 2019. You can download the full publication here. RBWM have a Traveller Local Plan Issues and Options consultation which starts on Monday 14 January and runs until Monday 25 February 2019. 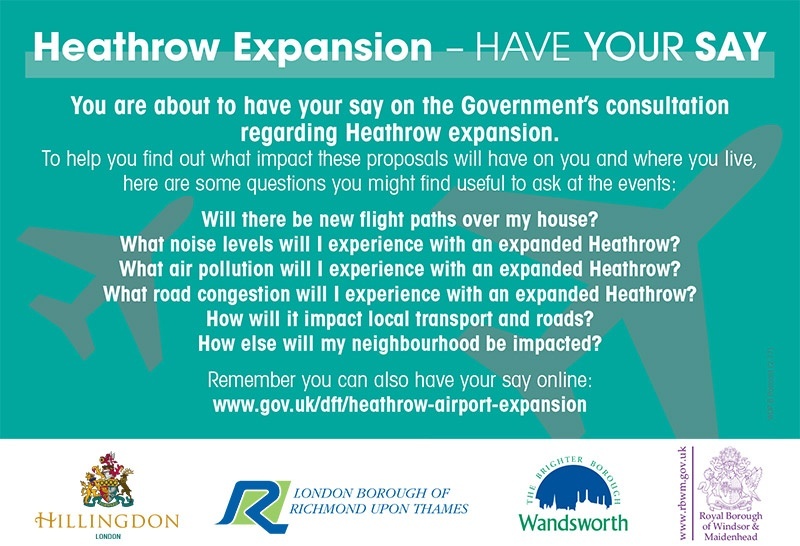 Further information on the consultation can be found by clicking here. Should you have any queries about the documents or the consultation process please contact RBWM by phone on 01628 796357 or email travellerlocalplan@rbwm.gov.uk. The Police and Crime Commissioner (PCC) for Thames Valley, Anthony Stansfeld, has launched a survey seeking the public view on an increase in the police element of the council tax by £2 a month* On Thursday 13th December the Home Secretary announced the provisional police funding settlement for 2019/20. In response to the exceptional operational demands on the police, particularly in areas such as Thames Valley, the Government is increasing the funding available to PCCs by up to £813 million. However, this is provided all PCCs increase the police portion of the council tax by £2 a month or £24 a year (equivalent for a Band D property), which, collectively, will raise £509 million of the £813 million increase in funding. Anthony Stansfeld said: “The Thames Valley Police budget has been cut by £101 million over the last eight years which has resulted in significant cuts to police officer and staff numbers. This year the Government has encouraged all PCCs to raise the policing element of the council tax precept for all households. To prevent further damaging cuts to policing and restore some important frontline policing capability I would like to make use of this Government advice and raise the council tax precept accordingly. “Demand on police forces nationally has risen significantly in the last year as a result of an increase in non-crime business, higher crime numbers, the increasing complexity of crime, and the increasing reach of criminals both physically and via technology. Throughout this Thames Valley Police has been efficient and effective but having already faced significant cuts since 2010/11 the process of identifying new cash savings is becoming ever more challenging. However, we are committed to making policing even more efficient and have already identified over £4m of new savings in 2019/20.” “My focus for the future continues to be on delivering strong neighbourhood policing for all of the communities across the Thames Valley whilst addressing the serious threats and hardship posed by criminals. *This is the equivalent for a Band D property. The increase for other property Bands is set out in the table available with the survey on the above link. Highways England have announced that the planned weekend closure of the A404 near Marlow has been scheduled to take place in January 2019 to allow the refurbished footbridge to be reinstalled, following completion of the repair works. They have been working in conjunction with the various local highway authorities to establish a weekend where no other roadworks or closures are taking place to avoid any clashes along the diversion routes, and also wanted to avoid December due to the increased traffic at weekends in the run up to Christmas. The closure is scheduled to take place from 9pm on Friday 11 January through to 5am on Monday 14 January 2019. During this period they will be closing the A404 north and southbound carriageways, between the junction with the A4155 just outside Marlow and the Bisham Roundabout. Parkway, which runs parallel with the A404, will remain open over the weekend period; however, they’ll need to close it for periods of up to 15 minutes on Saturday while the crane is lifting the bridge and staircases. These closures will be controlled by stop/go boards. Delays are expected during this weekend closure, and it is advised that you plan ahead of your journey to allow extra time or avoid this route where possible. Should works not be able to take place on that weekend due to weather constraints (e.g. high winds), a contingency closure is planned for the weekend of 18-21 January 2019. Once the bridge is reinstated, there will be additional work to apply an anti-slip surfacing, therefore the bridge will remain closed for an additional two weeks to pedestrians. Thames Valley Police are launching their Local Winter Burglary Campaign across Windsor & Maidenhead, and over the coming weeks will be working on raising awareness to help prevent burglary. As part of this, you will see Police officers and Police Community Support Officers carrying out a range of crime prevention initiatives, which will include pop up burglary road shows, the use of a Crimestoppers Advan and High Visibility patrols, taking proactive messages across the area. As you may be aware, work is now underway on the M4 between junctions 3 and 12 to deliver 32 miles of new smart motorway. With this in mind, Highways England have released updated information via their newsletter to keep you up to date. Click here to read the latest issue. If you have any trouble viewing the attachment please visit the project website at www.highwaysengland.co.uk/m4j3to12 which will be updated throughout the project. As per the post below, here are the up to date details of a forthcoming road closure to take place in Maidenhead/Bray area. Access will be provided for emergency vehicles. That part of A308 Windsor Road, Maidenhead between its junctions with Holyport Road and B3028 Upper Bray Road. Is via A308 Windsor Road, A308 (M), M4, A355 Royal Windsor Way, A308 Maidenhead Road and A308 Windsor Road. To facilitate concrete repair to bridge soffit. Kier Highways have announced that on behalf of Highways England, they will soon be undertaking essential maintenance work to the bridge which carries the M4 motorway over the A308 Windsor Road near Bray (Maidenhead) in Berkshire. The bridge deck has suffered significant corrosion for the effects of previously leaking bridge deck expansion joints and as a result, extensive concrete repairs are required. This work is currently being scheduled to start on Monday 12 November 2018 and is expected to be completed in April 2019. To allow the scaffolding to be installed then dismantled, and for repairs along the centre of the bridge, the A308 beneath the bridge will be closed between Holyport Road and the B3028 Upper Bray Road overnight for a four week period (10pm to 5am). During these closures a clearly signed diversion will be in place via the A308, A332, M4 and A308(M). Vehicles which are not permitted to travel on the motorway are recommended to travel to the A308 Windsor Road/Maidenhead Road, A332 Royal Windsor Way, A355 Tuns Lane, A4 Bath Road and A308 Braywick Road. Once work along the centre of the bridge is complete, 24 hour narrow lanes will be installed along the A308 beneath the bridge for approximately 12 weeks. This will mean the right-turn lane under the bridge will be unavailable during this period. To reduce the risk of road traffic accidents and to maintain traffic flows, the right turn from the B3028 Upper Bray Road onto the A308 Windsor Road will be suspended and alternative route signed whilst works are ongoing. Both footways under the bridge will remain open during this phase. These works have been carefully programmed but are subject to change due to weather conditions or unforeseen circumstances – please check the yellow signs placed in advance at the bridge for confirmation of the closures dates/timings. To provide more details on the work and the traffic management restrictions which will be in place, an information event will be taking place where representatives from Highways England and Kier Highways (the principal contractor) will be available to answer any questions relating to the scheme. If you have any questions, or if you’d like to know about the work please contact Highways England on 0300 123 5000 or email info@highwaysengland.co.uk. You can download the full announcement in PDF format by clicking here. Sunningdale Parish Council has announced their BATTLE’S OVER event taking place at Broomhall Lane Recreation Ground on Sunday 11th November 2018 to mark 100 years of remembrance. The ceremony is in commemoration of the end of the war and is a programme of readings, hymns and songs. For further Information please contact Ruth Davies on 01344 874268 or email info@sunningdaleparish.org.uk. You can download the full announcement flyer in PDF format by clicking here. The Royal Borough of Windsor & Maidenhead have announced details of a forthcoming road closure to take place in Holyport from 20th August 2018, in order to facilitate a new water main supply. The road (the part of Sturt Green between the boundaries of property known as “Leaside”) will be closed each day between 09:30 and 15:30 from Monday 20th August until Friday 24th August 2018. No alternative route or diversion will be available, although all emergency vehicles will be provided access. (27th July 2018) The Parish Council are currently working with Thames Valley Police to move on the travellers that are on Holyport Green and we are grateful for their help. Notice of eviction has been given to the travellers and we have been led to believe that they will leave the area today. It would appear however that a number of travellers are now occupying Lodge Farm. The Farmer is aware that they are on the land and is also working with the police to hopefully move the travellers on. The process of moving people on is not a fast one, both the police and land owners (which includes the Parish Council) have a number of processes that have to be worked through before eviction can take place. If the travellers do not leave and the police are unable to invoke Section 61 powers then court action will need to be taken by the land owners. May we please ask in the meantime that if you experience any anti-social behaviour or criminal activity that you contact the police using the 101 number. The police do have limited powers to move travellers on but can only do so with sufficient evidence. Highways England have released the first of their monthly information bulletins, which are aimed at keeping the local community informed of forthcoming works taking place between junctions 3 and 12 of the M4 as it’s upgraded to a smart motorway. The bulletin includes specific closure dates, speed restrictions, and work timescales, so is well worth a read. You can download the full bulletin here in PDF format, or visit the Highways England website for further details. A big thank you to all those who supported these two events by coming to view the Open Gardens and attend the concert in the evening. The weather was beautiful and everyone enjoyed the opportunity to have a peek at other people’s gardens. The garden owners also thoroughly enjoyed chatting to you. The concert “Gardens in Words and Music” was a delightful compilation of choirs, soloists, instrumentals, poems and readings. Thank you also to all the many volunteers who helped at either or both events. We couldn’t have done it without you! We raised over £4000 which will be distributed equally between The Friends of St Michael’s and Thames Hospice. An amazing amount which made all the hard work worthwhile. Thank you again. Highways England have invited the general public to an information event to mark the launch of main construction works on the M4 Junctions 3 (Hayes) to 12 (Theale) upgrade to smart motorway. The construction is due take place in two stages, with the initial stage starting at Junction 7 (Huntercombe) to 12 (Theale) this summer, and the second stage starting at Junction 7 to 3 in early 2019. *July 2018 exhibitions are taking place around M4 junctions 7 to 12 where construction on this scheme will start. Further engagement will take place around junctions 3 to 7 in due course. Consent for the scheme was granted by the Secretary of State through the approval of the Development Consent Order (DCO) in September 2016. Since then they have been engaging with local authorities and statutory bodies to discharge the conditions attached to the made DCO. Advance works started on the scheme in 2017 and this summer, full-scale mobilisation works will start, including the establishment of construction compounds and clearance of some sites. This will see related traffic management for the main works on the ground in late summer, starting initially from junction 8/9 in both directions. A comprehensive program of communications and engagement with local communities and stakeholders is under way to raise awareness of the scheme. We would be delighted to offer a one-to-one tour of our exhibition with a Highways England representative at an event of your choice. Please let me know (via the project team email address as detailed below) if you would like a tour and, if so, which venue would be most convenient. For any further information, or hard-copies of the leaflet please contact the project team via M4J3to12smartmotorways@highwaysengland.co.uk or visit http://www.highways.gov.uk. You can view the leaflet online by clicking here. On Sunday 1st July 2018 from 2pm to 5pm, the High Sheriff of Berkshire, Graham Barker, will welcome all visitors to Open Gardens in Bray. These are typically private gardens and are not normally open to the public. It is expected that up to ten gardens will be open in addition to St Michael’s Church, the Church Tower and Jesus Hospital, and teas will be served in St. Michael’s Church Hall and at Jesus Hospital for those in need of some refreshment. Thames Hospice will be providing stewards and Thames Valley Police Cadets will be on duty throughout the village. Parking will be available on the Village Green courtesy of Bray Parish Council. Click here to view the official announcement poster and for ticket details. In the evening at 8pm on Sunday 1st July 2018 there will be a concert entitled Gardens in Word and Music in St. Michaels Church which will include recitals, choirs, poems and readings all embracing the theme of gardens. All proceeds are in aid of Thames Hospice and The Friends of St. Michael’s Bay. The Highways, Parks & Countryside Newsletter (Week commencing 21st May 2018) is now available on the RBWM website by clicking here. Details are as follows. To view full details of current and planned works on roads in the borough, including work being carried out by public utility companies, go to Roadworks.org. Brockenhurst Road (Sunninghill and South Ascot) – pothole challenge – Wednesday 23 to Friday 25 May 2018 – 2 way lights 9.30am to 3.30pm. Windsor Road (Ascot and Cheapside) – carriageway works – Monday 21 May 2018 – 2 way lights 9.30am to 3.30pm. Wells Lane (Ascot and Cheapside) – carriageway widening – Saturday 26 May 2018. Bray Road (Oldfield) – pothole challenge – Monday 21 to Friday 25 May 2018 – 2 way lights 9.30am to 3.30pm. Hibbert Road (Oldfield / Bray) – pothole challenge – Monday 21 to Friday 25 May 2018 – 2 way lights 9.30am to 3.30pm. East Road (Boyn Hill) – carriageway works – Wednesday 23 May 2018 – 2 way lights 9.30am to 3.30pm. Oakley Green Road (Bray / Clewer North) – carriageway repairs – Monday 21 May 2018 – 3 way lights 9.30am to 3.30pm. Forest Green Road (Bray) – carriageway works – Wednesday 23 May 2018 – 2 way lights 9.30am to 3.30pm. Windsor Road (Bray) – carriageway works – Thursday 24 May 2018 – 2 way lights 9.30am to 3.30pm. Dedworth Road (Bray / Clewer North) – footway works – Friday 25 May 2018 – 2 way lights 9.30am to 3.30pm. Hurley Bridleway (Hodgedale Lane) (Hurley and Walthams) – vegetation clearance by Ways into Work volunteers – Wednesday 23 May 2018. Waltham St Lawrence FP34 (off Hungerford Lane) (Hurley and Walthams) – vegetation clearance by Berkshire College of Agriculture volunteers – Thursday 24 May 2018. Victoria Road (Eton Wick) – carriageway works – Monday 21 May 2018. Imperial Road (Clewer East) – trial hole – Monday 21 May 2018 – 2 way lights 9.30am to 3.30pm. St Leonards Road (Clewer East / Park) – footway works – Tuesday 22 May 2018. Sheet Street (Castle Without) – site investigations – Tuesday 22 May 2018 – 2 way lights 12pm to 8pm. Victoria Street (Castle Without) – site investigations – Wednesday 23 May 2018. Westmead (Clewer East) – carriageway works – Wednesday 23 May 2018 – 2 way lights 9.30am to 3.30pm. Datchet Road (Eton and Castle) – footway and carriageway works – Wednesday 23 May 2018. Common Lane (Eton and Castle) – footway works – Thursday 24 May 2018. Vaughan Gardens (Eton Wick) – footway works – Thursday 24 May 2018. London Road (Datchet) – carriageway works – Tuesday 22 May 2018 – 2 way lights 9.30am to 3.30pm. High Street (Wraysbury) – footway works – Tuesday 22 May 2018. Datchet Footpath 9 (Datchet) – surfacing works – week commencing 21 May 2018. Many of the works listed above are weather dependent and rely on unhindered access. We aim to keep any changes to a minimum but dates are subject to change. Operational activities such as road markings and sign installation have to be flexible and are often arranged at short notice. Therefore they may not appear on this list; however Members will have been consulted on, and approved the changes prior to these works. With just over a week to go until the royal wedding visitors heading to Windsor to enjoy the big day and catch a glimpse of Prince Harry and Ms Meghan Markle are encouraged to carefully plan their travel arrangements. Crowds of well-wishers are expected to come to the town on Saturday 19 May and there are a large number of ways for people to get into Windsor, including park and walk, park and float, train, bus, bike and on foot. However visitors choose to arrive they are advised to check their journeys, pre-book and leave early on the day to avoid disappointment. Cllr Phill Bicknell, deputy leader of the council and cabinet member for highways, transport and Windsor, said: “We want as many people as possible to be able to enjoy this celebration and a key part of that is making sure people are in place as early as possible. “To ensure everyone’s safety the crossing points over the Long Walk from the town centre are likely to close around 11am so we’re encouraging people take this into account when they plan their journeys. “We have worked closely with a wide range of partners to make this as easy as possible but due to the large number of expected visitors we ask people to plan ahead and leave early on the big day. “There is going to be a real party atmosphere in the town throughout the day with local entertainers, large screens and food and facilities in the public viewing areas. Inspector Gavin Biggs, of the Thames Valley Police Roads Policing Unit, said: “We want as many people as possible to be able to come to Windsor and enjoy this day of national celebration. “Our advice would be to arrive as early as possible, and to be aware of road closures and how to get into the town. “For those people who are planning to drive to and from Heathrow Airport or to Legloand on the day, I would strongly advise you to plan your journey in advance and to allow extra time, as we expect the roads to be very busy on the day. “For those going to Legoland, an alternative route is in place which will help you to avoid the majority of the traffic heading to Windsor. “On the day, people will be updated about any further road closures or any changes to existing plans through a number of measures including social media, visual motorway signs, yellow AA signs and reports in the media. “I would encourage people to monitor these channels ahead oftheir journeys. “If you are coming to the town, please be aware traffic is likely to be moving slowly, so please be prepared for this, and ensure that you have food and water in your vehicle. For travel advice on the day please follow @RBWM and @ThamesVP on Twitter where the council and Thames Valley Police will be sharing the latest updates, including from a range of transport partners. From Monday 14 May AA event signs will be installed on the main approaches to Windsor directing traffic around road closures and along the best routes to reach the car parks outside of the road closure areas. There are a number of parking options that will not be affected by the road closures including 6,000 pre-bookable parking spaces available at the Review Ground (reserve here), a park and float car park at Windsor Racecourse (reserve here) and spaces at The Windsor Boys’ School, which will be provided on a first come first served basis on the day. A number of town centre car parks and on-street parking areas will also be closed or suspended. River Street will be closed to the public, Victoria Street will be set aside for resident permit holders, Romney Lock will be closed to the public and part of King Edward VII Avenue will be closed to the public. The Review Ground car park can be accessed from the A332 (Sheet Street Road) which is outside the road closure area. Directions will be sent out along with the confirmation details when tickets are reserved. Those coming from the M25, Staines or Old Windsor will need to take the signed diversion route from the Runnymede roundabout along the A30, towards Egham. Anyone who has not pre-booked their parking is advised not to attempt to drive into central Windsor. Windsor is served by two railway stations, Windsor & Eton Central and Windsor & Eton Riverside and GWR and South Western Railways are both putting on extra carriages on Saturday 19 May. Visitors planning on getting the train are advised to check their route well ahead of time, reserve tickets and allow extra time on the day. There will be queuing systems in place at a number of train stations on the network where visitors heading to Windsor are likely to be changing trains. You can find more information about South Western Railways services by following @SWR_help on Twitter or online: www.southwesternrailway.com/royalwedding. There will be a designated pick up and drop off point for getting the bus into and out of Windsor on Saturday 19 May at King Edward VII Hospital, St Leonards Road. A number of local services and connections to the town will be changing on the day as follows. White Bus 01 Towards Windsor Operate normal line of route to Rangers Gate then A332 Sheet Street Road to Fernhill, A383 Mounts Hill, B3022 Winkfield Road, High Standing Hill, St Leonards Road, traverse the one way system and terminate at the site of the old bus garage. Towards Ascot Depart the site of the old bus garage then A308 Osborne Road, Bolton Avenue, Bolton Road, A332 Kings Road then normal line of route. First Beeline 8 Heathrow T5 Friday 18: The 2225 departure from Terminal 5 will not serve Windsor Town Centre, it will divert via Datchet. Saturday 19: All services up to the 0710 from Slough and 0659 from Terminal 5 will divert via Datchet. After 0710 there will be no Slough-Windsor or Windsor-Old Windsor services. Number 8s will operate Slough-Heathrow (via A4)-Old Windsor and return. Buses will pass all these points at the usual time. This service will remain in operation until the end of the day. Courtney Buses 2 Towards Slough and Dedworth This will run non-stop between Orchard Avenue (Dedworth Road) and Windsor Road (McDonalds) in both directions. 10 Dedworth and Heathrow This will run non-stop between Orchard Avenue (Dedworth Road) and Datchet Green in both directions. 15/15A Eton Wick and Slough This will not serve Eton High Street or Brocas Street, but will turn towards Slough at Eton College Chapel. 16/16A Maidenhead and Windsor This will run only as far as King Edward VII Hospital where it will terminate. Buses towards Maidenhead will start from King Edward VII Hospital. 702/703 Both directions Services running as normal but diverted to only stop at King Edward VII Hospital. We expect usual bike racks to be busy and are installing more temporary cycle parking at the Review Ground. The easiest routes into Windsor by bicycle are along the National Cycle Network Route 4 (NCN4) which is clearly signposted on approaches from Slough/Maidenhead and from Old Windsor/Staines. Bicycles will not be permitted in the public viewing areas. Cycling is not usually allowed on the Long Walk but this will be suspended on the day of the royal wedding to allow visitors to arrive by bicycle. People are asked to push their bikes when they arrive at areas where there are large crowds. On the day there will also be a variety of clearly signed walking routes to help visitors to get into town, including from the variety of temporary car parks around Windsor. There will be stewards and Royal Borough Ambassadors along these routes to help visitors. 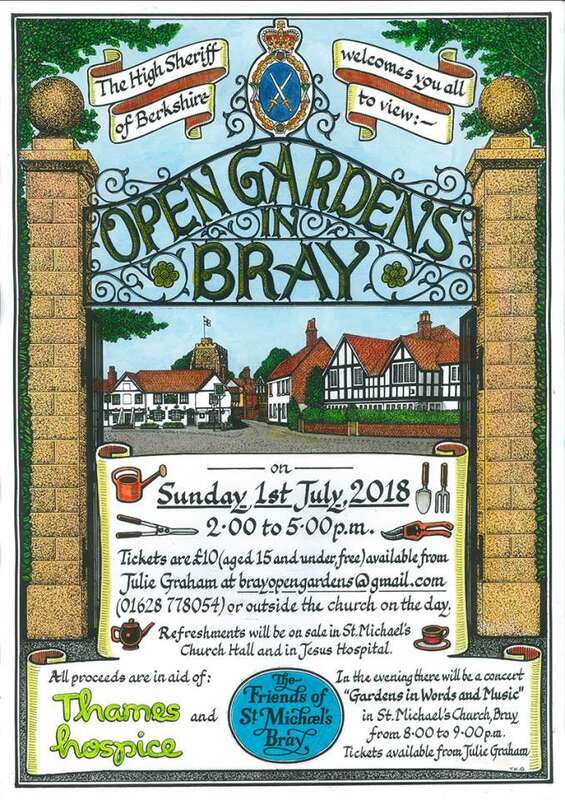 The High Sheriff of Berkshire, Graham Barker, welcomes all visitors to the picturesque village of Bray on Sunday 1st July 2018 from 2pm to 5pm to view private gardens not normally open to the public. It is expected that up to 10 gardens will be open in addition to the Lych Gate Garden, St Michael’s Church, the Church Tower and Jesus Hospital. Teas will be served in St Michael’s Church Hall and at Jesus Hospital for those in need of some refreshment. Thames Hospice will be providing stewards and Cadets from the Thames Valley will be on duty throughout the village. Parking will be available on the Village Green courtesy of Bray Parish Council. In the evening at 8pm there will be a concert entitled Gardens in Word and Music in St Michael’s Church which will include recitals, choirs from St Michael’s and Thames Hospice, poems and readings all embracing the theme of gardens. Readers will include Michel Roux, Tim Brooke-Taylor, Lynda Jones, Sarah Greene and Ambassadors from Thames Hospice. Tickets, £10 per person for each event, can be obtained by contacting Julie Graham on 01628 778054 or by email to brayopengardens@gmail.com. The funds raised will be shared between Thames Hospice and St Michael’s Church. Please note, the Parish Office is closed today 1st March, and we hope to be open again tomorrow. If you, like us, are fed up with all the cans and bottles and sweet packets (and worse) that litter our paths and verges, then please come and join our monthly community litter-picking session this Sunday, 4th March. Rather handily, this coincides with Keep Britain Tidy’s Great British Spring Clean weekend, so what better way to celebrate, really? You might have read about our trial outing last month in the Maidenhead Advertiser. We collected 15 bags of litter just along two short stretches between the Green and Bargain Booze! Believe it or not, it was really good fun as well as an incredibly efficient way of cleaning up the village. Lots of people came up to us and said how encouraged they were to see us in action and could they please join us in future. Obviously we said yes. 11am on the Green, by the war memorial. It will take no more than an hour and then those who want to can nip off to the pub afterwards! This time we will be targeting the area around the shops and the school, and as many of the surrounding streets as we can. Please feel free to suggest other areas of concern and we can target them in future sessions. …please bring a bin bag, litter picker if you have one, and rubber gloves. Obviously, everyone takes part at their own risk, so please just use your common sense when litter picking, particularly when it comes to traffic. If you spot anything that looks dangerous/too big to pick/downright revolting, just note where it is and we’ll contact the street-cleaning department so they can remove it instead. Dates for 2018: March 4, April 8, May 6, June 3, July 1, Aug 5, Sept 2, Oct 7, Nov 4 and Dec 2. Some people have said they just can’t do Sundays, so if there’s enough demand we might organise some Saturday sessions in future, too. RBWM run an Adopt A Street scheme. If you sign up you get (eventually) a kit comprising a litter picker, a hi-vis jacket and some thick rubber gloves. Unfortunately, lack of manpower means the map of adopted streets on their website is no longer updated, so we are going to take this on instead. Please let us know on Sunday if you would like to “adopt” even just a short stretch of street. You won’t be held to account if litter ever appears on your patch (honest!). It’s just a really effective way of helping keep litter to a minimum, and there is a strong correlation between the volume of litter and the likelihood of yet more being dropped. The aim is ultimately to get every street in the village adopted. Please note that the Parish Office will close at 12:30 on Friday 22nd December and will reopen on Tuesday 2nd January at 9:30. We wish you all a Happy Christmas and a Peaceful New Year. Here are the details of a forthcoming road closure to take place in Bray. All emergency services will be provided access. Between 09:00 and 16:00 hours on Sunday 3rd December 2017. The part of B3028 Upper Bray Road between its junctions with Cannon Hill Close and Hanover Mead. Via A308 Windsor Road, A308 Braywick Road, Stafferton Way, Stafferton Way Link Road, B3028 Bray Road and A3028 High Street. To facilitate essential repairs to the Bailey Bridge by RBWM contractor. Kier Highways, on behalf of Highways England, will be resurfacing the roundabout at junction 8/9 of the M4, to ensure the network remains in a safe condition for road users. Work will also involve laying anti-skid material at identified areas and renewing the road studs and markings. Work is currently scheduled to start on Thursday 23 November 2017* and is expected to take ten nights to complete (Monday to Friday only). During the closures clearly signed diversions will be in place; the primary route to get between Maidenhead/the A404 and the M4 will be via the A308 and A332. Confirmed dates for the closures will be displayed in advance on signs at the junction. We would like to apologise in advance for any inconvenience caused by the work; if you have any questions, or if you’d like you know about our work please contact us on 0300 123 5000 or email info@highwaysengland.co.uk. *Please be aware that these works have been carefully programmed but are subject to change due to weather conditions or unforeseen circumstances. Kier Highways, on behalf of Highways England, will be resurfacing the A308(M) northbound carriageway (from the M4 to the Braywick Roundabout), to ensure the network remains in a safe condition for road users. Work will also involve laying anti-skid material on the approach to the roundabout and renewing the road studs and markings. Highways England undertakes the majority of resurfacing works on the Strategic Road Network using a lower noise material. This material is thinner than conventional Hot Rolled Asphalt and has qualities which reduces noise levels. Work is currently scheduled to start on Monday 20 October 2017 and is expected to take two nights to complete. In order to carry out the work as efficiently and safely as possible, the A308(M) northbound carriageway will be closed overnight (9pm to 6am). During the closures a clearly signed diversion will be in place via the A404(M) to junction 9b, east along Bath Road to Maidenhead centre, then south along Braywick Road. Please be aware that these works have been carefully programmed but are subject to change due to weather conditions or unforeseen circumstances. Confirmed dates for all closures will be displayed in advance on signs at the junction. Kier would like to apologise in advance for any inconvenience or disruption during the work. For further information, please phone 0300 123 5000 or email info@highwaysengland.co.uk. Elections for the casual vacancies in Bray (Village) Parish Ward and Bray (Holyport) Parish Ward will be held on Thursday 16th November 2017. The links to the notices may be viewed online by clicking here. The window for submission of nomination papers is open and closes on Friday 20 October at 4pm. Completed nomination papers must be hand delivered to the Returning Officer at the offices of Royal Borough of Windsor & Maidenhead, on any day after the date of the notice, during normal office hours but no later than 4pm on Friday, 20th October 2017. RBWM request that an appointment is made so that they can ensure that there is someone available to receive the papers. The Parish Council has made its’ response to the Regulation 19 consultation, the details of which can be seen on the downloadable documents below. NOTICE IS HEREBY GIVEN that due to the resignation of Peter Janikoun, a casual vacancy now exists in the office of parish councillor for Holyport Ward. The vacancy will be filled by election* if, within fourteen days of the date of this notice, any ten local government electors for the said ward of the parish submit a written request to the Returning Officer, Town Hall, St. Ives Road, Maidenhead, SL6 1RF. If no such written request for an election is received by the Returning Officer within the time specified, the vacancy will be filled by co-option by the Parish Council. * The election will take place not later than 60 days from the date of this notice. Bray Parish Council is providing the following Briefing Notes to Residents with regards to the current Reg 19 Borough Local Plan. We are encouraging everyone to respond to the consultation and to use these notes for guidance in the preparation of their submission. You may also wish to refer to some Frequently Asked Questions which have been prepared by RBWM Residents Action Group (RRAG), available to download by clicking here. There is NO restriction to what you can comment on in relation to this Plan. Anyone can comment on ANY ASPECT of the Plan. If you submitted comments under the Reg 18 Consultation, you should be aware that these will NOT be forwarded to the examining inspector. If you feel that your comments made under Reg 18 have not been taken into account by RBWM in the Reg 19 version, you should send them in again. Only submissions to this Reg 19 consultation will be seen by the inspector. It is critical that all comments you send in include a reference to the specific section(s), paragraph(s) and/or policies in the Plan they relate to. All the Notes below do so. The comments you make on each topic will be considered to be one “Representation” – that is the term/description that the Borough uses. You can make as many Representations as you wish. You can choose to comment on any one, more or all of the topics we suggest below, and also to add as many others as you wish. It would be best if you could paraphrase your comments, and if you have personal examples that support the argument, please add these as they will contribute to the “supporting evidence”. The closing date for responses is 5pm on Wednesday 27 September 2017. Submissions received after this will not be accepted. You can download the full briefing notes here. A casual vacancy now exists in the office of parish councillor for Bray Village Ward, following the resignation of David Burbage. Click here to read the full announcement. Please note that Holyport Road (Aysgarth Park to Langworthy Lane) will be closed between 9.00am to 6.00pm for resurfacing on Thursday 31 August and Friday 1 September 2017, for further information please click here. To view details of current and planned works on roads in the borough, including work being carried out by public utility companies, go to Roadworks.org. 2nd August 2017: A statement from the leader of the Royal Borough on the extension of the Borough Local Plan Regulation 19. Cllr Simon Dudley, leader of the council, said: “We are pleased to announce an extension to the period for making representations on the Borough Local Plan: 2013-2033 Submission Version which we published on 30 June 2017. “This latest stage in the plan-making process is known as Regulation 19. Formal steps will be taken next week to ensure that the publication and notification of the procedure for making representations and the new deadline fully accords with Regulation 19 of the Town and Country Planning (Local Planning) (England) Regulations 2012. “We want to make clear that no other changes are being made to the Borough Local Plan: 2013-2033 Submission Version, or supporting documentation which continues to be available for inspection online, in borough libraries and parish offices. “The extended deadline for making representations will be 5pm on Wednesday 27 September 2017. “Before the Borough Local Plan: 2013-2033 Submission Version can be submitted to the Secretary of State for independent examination by a planning inspector, it must be published (under Regulation 19) to enable any person to make representations to us, the Royal Borough, about the plan (under Regulation 20). “All duly made Regulation 20 representations will be sent to the inspector appointed to examine the Borough Local Plan: 2013-2033 Submission Version, who must consider representations made in accordance with Regulation 20 before deciding whether to recommend that the plan be adopted. “We have decided to extend the period for making Regulation 20 representations following queries from residents and local resident groups who were concerned that our earlier press releases and library communications about Regulation 19 did not accurately explain the procedure for making Regulation 20 representations. “To avoid any confusion or misunderstanding, I have asked officers to clarify that any person may make representations about any aspect of the Borough Local Plan: 2013-2033 Submission Version which we published on 30 June 2017. “I have also asked officers to take the necessary formal steps to ensure that we fully comply with the legal requirements concerning the extended publication period (under Regulation 19) and the procedure for making representations (under Regulation 20). Those steps will be taken next week. “This extension will allow any person who wants to make representations on the Borough Local Plan: 2013-2033 Submission Version extra time to do so. We want to be clear that Regulations 19 and 20 in no way restrict the nature of the representations that any person can make to us about the plan. “By taking this step, the period for making representations on the Borough Local Plan: 2013-2033 Submission Version which we published on 30 June 2017, will exceed 12 weeks. Copies of the plan are available in all borough libraries and parish offices as well as online. Once adopted, the plan will run from 2013 until 2033 and will help guide where developments including housing, leisure, retail, office and open space should be sited and how they will fit in with existing and planned infrastructure. There are a number of different ways for residents and interested parties to make representations about the plan at this stage including online or in writing. Online through the consultation portal where representations can be made against specific consultation points (e.g. chapters/maps etc.). By emailing planning policy: a representation form (which is available to download from the website, or available in hard copy from libraries/parish councils), free text or a scanned written document. By sending letters to Planning Policy via the freepost address. By calling the contact centre and asking them to record comments before sending these comments back to the resident for signing off and submitting. The new deadline for making representations will be posted on the council’s website next week. Each year the council’s annual return is audited by an auditor appointed by Public Sector Audit Appointments Limited. Any person interested has the rights to inspect and make copies of the accounts to be audited and all documents relating to them. Click here to view the scanned notice document. The submission version of the Bray Neighbourhood Local Plan is available to view online and at the Parish Office in hard copy. Bray Parish Council, on behalf of the parish council and the steering group, has submitted a neighbourhood plan for the Bray neighbourhood area. The plan aims to manage the development coming forward in the neighbourhood area to better reflect the wishes of the community in the area and to take greater account of what makes the area special to the community. It sets out a number of objectives for the area and planning policies to guide future development and to help determine planning applications in the area. Click here to see the announcement poster. The Council has agreed that the Borough Local Plan (2013-2033) Submission version, Policies Map, Sustainability Appraisal and other supporting documents will be available for inspection under Regulation 19 of the Town and Country Planning (Local Planning) (England) Regulations. At all Borough Libraries and Parish and Town Council Offices during their normal opening hours. Consistent with national policy – enabling the delivery of sustainable development in accordance with the NPPF. Representations must be received no later than 17:00 on Friday 25 August 2017. The best way to view and make representations on the Borough Local Plan (2013-2033) Submission version is to use our online portal for making representations. Please download our Guide to using the Online Portal for further information. All representations received will be submitted to the Secretary of State and considered as part of an independent Examination by a Planning Inspector. Please note that representations must be attributable to named individuals or organisations. They will be available for public inspection on our Portal and Borough website and cannot be treated as confidential. We regret to inform you that the main council meeting of 26th June 2017 has been cancelled. Please check back for further information. This year’s Bray in Bloom judging dates have been confirmed, with regional judging taking place on Tuesday 11th July from 10am, and the national judging taking place on Tuesday 1st August, again from 10am. This year’s colours to adopt are ruby, green and white, and pink. Call 01628 778054 for further details or click here for the announcement flyer. Kier Highways, on behalf of Highways England, have announced they will be resurfacing sections of the M4 east and westbound carriageways near Shurlock Row, to improve people’s journeys and ensure the network remains in a safe and serviceable condition. In order to carry out the resurfacing work as efficiently and safely as possible, the M4 westbound carriageway from junctions 8/9 to 10 will be fully closed overnight between 10pm to 6am, when traffic flows are at their lowest. A clearly signed diversion will be in place via the A404(M), A4 and A329(M) and confirmed dates for the closures will be displayed in advance on signs along the M4. For the full announcement and further information, click here. The Annual Parish Meeting for Bray will be held on Monday 10th April 2017 at 7:30pm in Braywood War Memorial Hall, including presentations concerning the Broken Borough Local Plan, Restoring the Cut between the Thames, the Holyport Village Fair, the Fifield Fun Day, and an annual report. Questions and answers sessions will be held for each presentation. 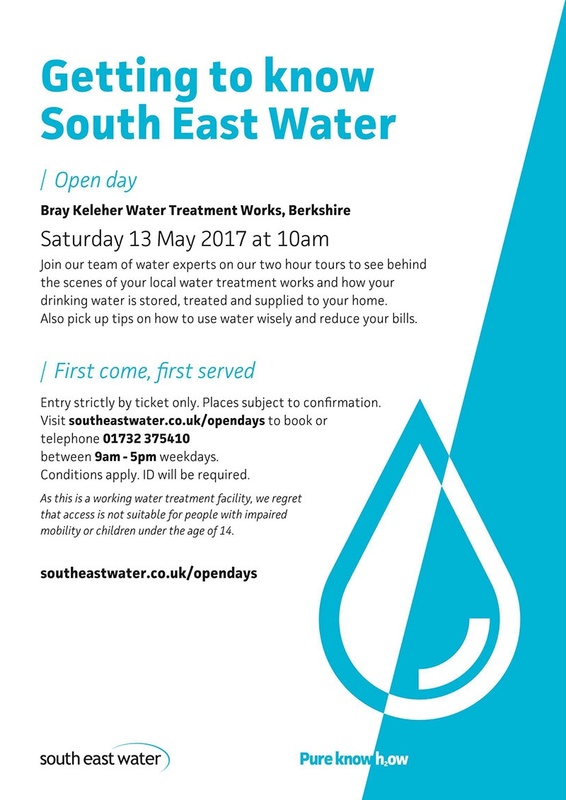 South East Water are inviting the public on a first come, first served basis, to join their team of water experts on a series of two hour tours to see behind the scenes of the local water works on Saturday 13th May 2017 at 10am. This includes seeing how your drinking water is stored, treated and supplied to your home, and some handy tips on how to use water wisely to reduce your bills. Full information can be found on the image to the right. Click to view it full size. Please note that the construction of a new footway and bus stop (outside Oakley Green cemetery) are due to take place on the A308 Windsor Road (Bray) between Monday 6 and Friday 10 March 2017. Plans are underway with a view to increasing airport capacity in the south-east of England and the government’s preferred scheme for meeting the need for additional airport capacity in the south-east of England is a new north-west runway at Heathrow Airport. Click here for further information and to have your say in the scheme. A casual vacancy now exists in the office of parish councillor for Dedworth Ward. This vacancy will be filled by election* if, within fourteen days of the date of this notice, any ten local government electors submit a written request to the Returning Officer, Town Hall, St. Ives Road, Maidenhead, SL6 1RF. Further details of the vacancy can be found by downloading the PDF document here. Here are the details of a forthcoming road closure to take place in Bray. This should give you the opportunity to plan ahead, to make suitable arrangements and to share the information with all your appropriate stakeholders. Location: That part of B3028 Upper Bray Road that between its junctions with Cannon Hill Close and Hanover Mead. Alternative Route: Is via A308 Windsor Road, A308 Braywick Road, Stafferton Way, Stafferton Way Link Road, B3028 Bray Road and A3028 High Street. Reasons: To facilitate essential repairs to the Bailey Bridge by RBWM contractor. Contact: Mr. Changnan Du of Jacobs on behalf of RBWM. His telephone number is 01189 467680. The Regulation 18 consultation has now closed, RBWM will be consulting on Regulation 19 during late Spring 2017. For further information concerning Bray Parish Council’s response to the Borough Local Plan please click here. Following Storm Angus, the first storm of the winter, the Met Office has issued information and advice on how to prepare for winter weather including health and well-being advice. Hopefully we will not see any severe storms this winter, but in the event of any severe weather we ask that you follow the advice on the following link and please check on any vulnerable neighbours. On Wednesday 16th November Ken Elvin, Chairman of Bray Parish Council, along with Steve Adams, Chairman of the BPNP Steering Group, formally submitted the Plan and supporting documentation to RBWM. The Plan itself was Approved by Bray Parish Council at a meeting on 11th July 2016. It is now RBWMs responsibility to take the Plan through the next steps of the process leading to Referendum. This represents a major milestone for the BPNP Steering Group five after five and a half years’ worth of meetings, consultations, drafts, discussions, health-checks and a great deal of commitment from its members. For details of planned Council Highways works this week please click here. To view details of current and planned works on roads in the borough, including work being carried out by public utility companies, go to Roadworks.org. Furthermore, please be advised that the M3 motorway will be closed in both directions between junctions 2 and 3 for one weekend while Woodlands Lane Bridge is demolished and other works are undertaken. It will be closed between 9pm on Friday 18th November 2016 and 5.30am on Monday 21st November 2016. Diversion routes will be clearly marked for the duration of this closure and drivers are encouraged to find alternative routes and to avoid the M3 during this time. For more information visit www.highways.gov.uk/m3j2-4asm or you can download a PDF of the notice here. The return may be viewed during Parish Office opening hours 9:30 – 12:30, Monday – Friday. Copies will be provided to any local government elector on payment of £0.20 for each copy of the Annual Return. The Parish Council owns two allotment sites – one containing plots in Bray Village to the rear of the Village Hall car park, and another containing plots adjacent to Gays Lane Field, off Lindores Road in Holyport. Each year the Parish Council awards a prize to the owner of the Best Kept Allotment and welcomes all new tenants to take part in this friendly competition. The competition results for 2016 can be viewed here. The 2016 Summer Newsletter is now available for download, and details the Regional Judges visit to the Bray Village Conservation Area, specifically what needs to be done and what they’ll be looking for. Remember, once again the Bray in Bloom Committee will be awarding prizes for the Best Hanging Basket, Best Front Garden and Best Pot or Container in the Village, all of course which should use the Village colour scheme. You can read the full newsletter here in PDF format. To assist Bray’s 2016 regional bloom entry a plant sale will be held in Bray Village Hall, on Sunday 22nd May 2016 from 10.30am until 1:00pm. We’d love for you to attend and appreciate everyone that shows their support. For further information please call 01628 778054. The 2016 Spring Newsletter is now available for download, noting a number of important changes at the Parish Council and a plethora of exciting updates. Click here to download the document in PDF format. Bray Parish Council unanimously adopts the Bray Parish Neighbourhood Plan for submission! At a Full Council meeting on the evening of Monday 23rd February 2016, Bray Parish Council unanimously voted to adopt the Bray Parish Neighbourhood Plan Version 3 for submission through the Royal Borough of Windsor & Maidenhead for Inspection and Referendum. This decision is subject to a one day workshop with Planning Consultants, Bray Parish Councillors, RBWM Officers and Steering Group members to agree the final detailed policy wording and ensure that the Plan is ready for Inspection. 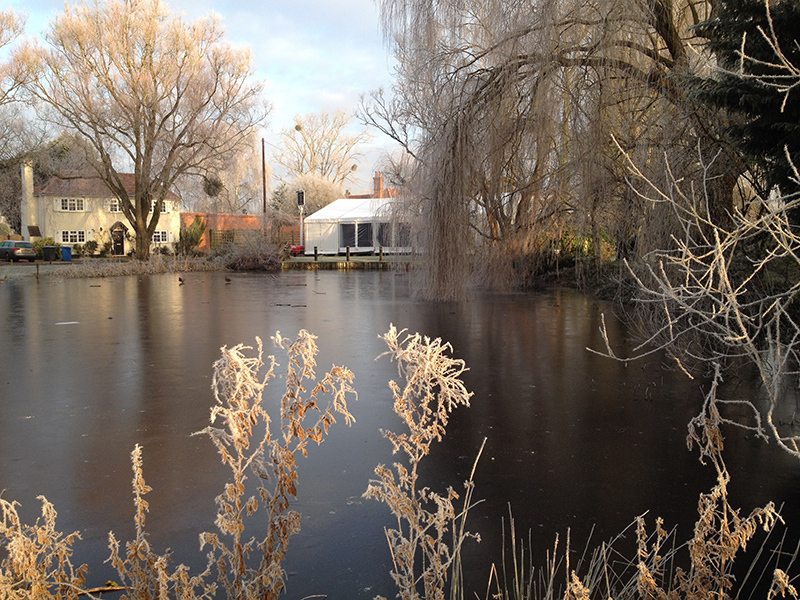 RBWM is currently consulting with the public regarding the review of Bray Parish, the deadline is Tuesday 16 February for the public to make comments to RBWM about the proposal to incorporate the Fisheries into Bray. Bray Parish Council has been developing a Neighbourhood Plan. This has been led by a Steering Group made up of local volunteers and, after taking into account views expressed by residents during previous consultations, a Draft Plan has been prepared. Click here to find full details concerning the Pre-Submission Consultation, including downloadable documentation in Word (.docx) and Adobe (.pdf) formats. Contact the Elderly-Maidenhead Need YOUR Help! Contact the Elderly Maidenhead has been running for 15 years taking out 6-8 local elderly people once a month, 12 months a year, to tea parties. Their guests are aged from 75 into the 100’s, and local family hosts welcome the group into their homes for the tea party. This regular monthly outing makes a huge difference to the life of an isolated person and gives them something to look forward to. Often this is the only social outing in their lives. Their group needs a group Co-ordinator/driver for a few hours a month and more drivers to drive the elderly guests one Sunday afternoon a month. Can you make a difference to elderly people in your community and enjoy a very happy Sunday afternoon? The South East Water Open Days are a unique opportunity to go behind the scenes of a water treatment works and find out where your water comes from and they are opening the doors of their Keleher Water Treatment Works at Bray, Berkshire on Saturday 25 April 2015.